“I grew up in a Christian home, but there was a lot of sickness in my family. My dad had cancer, and my grandparents (his parents) had cancer as well. I felt a lot of stress, and I did not have a good relationship with my dad at all. I was sexually abused from age 7-12, which caused a lot of anxiety for me that I dealt with by cutting. Later, I got into drugs and became very rebellious. I didn’t want anything to do with anyone and had poor relationships. I found out about Mercy Ministries through the internet and decided that I needed to apply to the program. Since coming to Mercy, the verse in Hebrews 13:6 which says, ‘The Lord is my helper, I shall not be afraid. What can man do to me?’ as changed my life. I used to look at that verse and say – ‘Man can do so much to me!’ Now I look at it as, ‘Yes, man can hurt me, but man cannot take away the plan that God has for me.’ I have experienced real freedom at Mercy. It’s not about independence or rebellion, or doing things my way. It’s about totally depending on God and surrendering to God. “The atmosphere I grew up in was really unstable. I was eventually put in foster care and grew up in the state system. I never had a place to call home, and I felt like I didn't belong anywhere and no one loved me. During that time, I was physically and sexually abused and raped numerous times. I had such a skewed view of love, life, God, relationships, and family. I was hurt, angry, confused, broken and depressed, and I didn't know how to deal with anything. I felt so much pain and worthlessness that I started cutting myself to temporarily numb the pain. I hated myself, and I felt like my life was too far gone to fix anything, so I rebelled against everything possible. I later discovered drugs, smoking, and drinking, and they became my escape. I'd go to sleep every night hoping to never wake up. I came to Mercy thinking that God was a joke or a fairy tale. I doubted that Mercy could help me because nothing else had worked, but God had other plans. It's been an extremely long and hard road, but it's been way worth it. I've come to realize God's love for me – a love that never ends and has no conditions. I love life, and I just want to spread the word of joy and hope and be a bright light in the darkness. “I grew up in a Christian home, but from a very young age I realized that I was more mature than most people my age in many ways. Satan really used that to his advantage, using my maturity to make me feel like I didn’t fit in and telling me that I stood out because of it. By fifth grade, I was also much more mature physically than the other girls, and because of that, I began a diet that very quickly spiraled into a very severe eating disorder. I was in and out of psychiatric hospitals and treatment centers for eight years. Before coming to Mercy Ministries, I hit my lowest point where I was very near death physically, but I already felt dead spiritually, mentally and emotionally. God had no place in my life, and my conscience was almost completely gone. I didn’t care about anything except my eating disorder and the power and control that it gave me. Death from my sickness seemed like a welcomed escape. I found out about Mercy through several girls that had gone through the program and I had seen the transformation take place in their lives. I decided it was my only hope for freedom, so I applied to the program. At Mercy, I really struggled with giving up control for the first four months. I would give God bits and pieces of my broken life, but then take it back. After failing miserably at Christmas when I was home on break, I returned to Mercy and tried to continue this game of "tug of war". Finally, one night in January, I laid on my bed and thought, ‘This can’t be it. God you’ve got to have more for me.’ From that night on, I began to allow God to move inside of me in miraculous ways. He restored my physical health in ways the doctors never thought possible, but more importantly, He set me free. God didn’t deliver me from everything right away, and it’s been a long process, but He has taken me from a place of total brokenness to having so much hope and joy for my future. I now know that there is something much more out there for me, and I am so excited to be able to tell of all the Lord has done for me. “I was adopted when I was two weeks old, and my parents got married when I was seven. After that, we moved around a lot. As a result, I never had many friends, and I tended to isolate myself. By the time I was 12, I was really depressed and I didn't know how to handle my emotions, so I turned to anorexia hoping to find acceptance. When that wasn't enough, I turned to self-harm, which soon became a normal part of my everyday life. My parents found out when I was 13, and the only way they knew how to help me was to take me to counselors and psychiatrists, but nothing really worked. All they told me was that I was hopeless, and because I was so suicidal all they could do for me was to put me in a psychiatric ward. When I was 14, I discovered bulimia and started purging almost every day. I found out about Mercy through a Christian magazine called Brio and decided to apply to the program last year. When I came to Mercy, I thought I could continue with my eating disorder and self-harm, as well as try to surrender to God at the same time. I finally realized that I could not say I was surrendering and still hold on to my eating disorder. I became a Christian in September, and since then, God has shown me that it doesn't matter what I've done, He still loves me and He still has plans for my future. Jeremiah 29:11 says, ‘For I know the plans I have for you, says the Lord. Plans to prosper you and not harm you, but to give you a hope and a future.’ I thought that because of everything that had happened in my past and everything that I had done, I wouldn't have the future God planned for me or that He wouldn't want me anymore. God has shown me that He is a daddy who will never hurt me and is always there for me. “I grew up in a family that went to church, but I saw God as more of a religion than an actual relationship. I didn’t really know who God was and at the time I did not want anything to do with Him. I was a very negative and unhappy child. I felt like I was never good enough or that I would never meet my parents’ standards. Around sixth and seventh grade, I developed intense anxiety and depression. That led me to self-harm. I tried anything I could to fix myself because I wanted to be happy. I tried eight different medications, but they only made me feel worse. I felt was hopeless and did not see a future for myself, so I attempted suicide. I found out about Mercy Ministries through Dawson McAllister’s Teen Hope Line and applied to the program. At Mercy, I came to know God for who He is. He became real to me and not just a religion. God has restored joy and peace in my life. I am completely free now and I AM NOT GOING BACK! God has shown me my identity in Him and that He accepts me for who I am. It’s not how the world sees me or how others see me, but how He sees me that really matters. “I grew up in a Christian family and went to church, but it was never real to me. When I was nine, my mom died but I never grieved that loss because I didn’t know how. After she died, I lived with my dad and my brother and developed a horrible self-image. I started cutting and I continued to until about a year ago. When I was 13, my dad left me and I moved in with my aunt and uncle. I am so thankful for them, and I have lived with them for three years now. Since I have been at Mercy, God has given me a foundation of truth. He is my rock - no matter where I go or what I do, He never changes. No matter what happens in your life, He stays the same. “I was raised in the occult for the first 13 years of my life and was sexually abused by multiple people, both men and women. I started cutting at a young age and was involved in bad relationships and drugs. At age 19, I accepted Jesus Christ into my life and I moved to Oklahoma City to go to school, but I was continually running from my past. I started having what appeared to be grand mal seizures, but they were actually panic attacks. I was in and out of hospitals and saw doctors for months, but no one knew what was going on. God continually kept knocking on the door of my heart and was telling me that I needed to let Him in to deal with the issues from my past. I tried to hold everything together on the outside by getting involved in youth conferences, teaching in schools, and doing ministry, but at the end of a day and I would cut myself and I just wanted to die. I found out about Mercy through Joyce Meyer Ministries, and I knew that it was my last hope. My first two months at Mercy, I could hardly make it through the day, but I had an amazing counselor at Mercy who kept me motivated! She helped me deal with my issues from the past and forgive those who have hurt me. That allowed God to come in and release healing in my life. As I allowed God into my heart, He began bring major change in my life. “A ten-year battle with an eating disorder was the most pressing issue I needed help with. I had been in treatment before and believed that if I could somehow manage the eating disorder behaviors, that I would never really be free. Mercy Ministries was an answer to prayer. My parents knew I needed help and learned about Mercy through our church. During my time at Mercy, God has only begun to show me how much He loves me and has freed me from deep-rooted shame and fear. I was finally honest with myself, God, and others, and when I expected judgment, I received mercy. God is showing me that I am fully loved and accepted just as I am. God really has set me free and transformed my life. “I spent many years of my life struggling and living without joy or happiness. My shyness and perfectionism caused me great pain. I started self-harming in the fifth grade to punish myself for not being perfect. In the seventh grade, I started to control my eating to lose weight in hopes of being accepted. Instead, this led to an eating disorder that controlled my life. I fell into a deep depression, and I no longer wanted to live. I found out about Mercy Ministries through my Christian counselor. She spent a lot of time looking on the internet for treatment programs for me because she did not want to send me anywhere that wasn’t Christ-centered. She finally found out about Mercy through a family whose daughter had applied to the program. Once I saw the website, I was set on coming to Mercy. God has done an amazing work in me while I have been here. I have been healed from having to take any medications to control my mood and sleep, which is wonderful. I have learned that I am who God says I am and not who the world tells me I am. God has given me joy that I have never experienced before. I now have a passion to live my life and to live for God. I can be who God created me to be without worrying about what others think of me. God has shown me His unconditional love and has restored my relationship with my family. He has given me hope for my future and He gives me the strength I need to make it through anything. “Before I came to Mercy Ministries, I struggled with self-harm, binge eating, depression, anger, and suicidal thoughts. After I attempted suicide and failed, I knew that I need help. I had never heard of Mercy Ministries before, but one day I received one of the Mercy magazines in the mail. I had not signed up for it, but it just arrived in my mailbox, so I knew that it was God showing me Mercy, and I applied to the program. Through my time at Mercy, God has given me joy and hope. Now I can smile and laugh. I have confidence because God has shown me who I am in Christ and that I have a future worth living for. 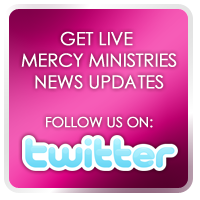 “I came to Mercy Ministries struggling with an eating disorder, over-exercising, depression, self-harm, and lesbianism. The eating disorder was so bad that my friends feared I would die. One of them told me about Mercy and I decided to apply to the program. Mercy Ministries has helped me understand God’s unconditional love for me. The staff at Mercy have helped me learn that I don't have to be ashamed of my past. I didn't think I could ever trust people again, but at Mercy God has also shown me the value of true friendship. Now I have lifelong friends, and He has shown me that it is all possible through Him. “Before coming to Mercy Ministries, my life was controlled by an eating disorder. At one point I was bingeing and purging up to 13 times a day and even staying up through the night to binge and purge. My mind was consumed by an obsession with food and control. I knew I needed help, so my mom told me about Mercy Ministries. After finding their page on MySpace, I applied to the program. During my time at Mercy Ministries, God has given me back a future and a hope. He has restored my mind and my broken heart. He has renewed and strengthened my weary and burdened spirit. God has also done a work of healing in my family and my relationship with them. He has taught me how to let people in and receive love and Godly discipline. He has taught me to face the hard things in life, rather than spending my life running. I can eat and sleep like a normal person again! I no longer live bound by fear. I can now take risks and enjoy the life and relationships God has blessed me with. “Before coming to Mercy Ministries Istruggled with anorexia, major depression, obsessive-compulsive disorder, and self-harm. I grew up with an angry and controlling family member, and I never felt loved. My parents divorced when I was seven, and I chose to live with my mom. This created a need for approval from my dad and everyone else. I felt like the divorce was my fault. As I grew older, I saw my dad less and I thought it was because I was getting bigger. In my mind the only solution was to make myself smaller so that he would love me more. In fifth grade I started to restrict things like ice cream and sugar. I entered high school at an already low weight, but decided to restrict food even more. I also started cutting in high school because I couldn't handle the anger and hurt I felt inside that I had been stuffing for years. At an alarmingly low weight, I was sent to an eating disorder inpatient treatment center. After an attempt to kill myself by taking several prescriptions and over-the-counter drugs, I had convinced by myself that I would be this way forever. I have an amazing friend who told me about a place that would change my life forever, Mercy Ministries. I applied to the program and was soon accepted. God began pouring His love on me from the moment I walked through Mercy's doors. At first I didn't know what to do with it, but eventually I let it sink into my heart. I am saved by grace, and I know that God accepts me for who I am and not for what I do or don't do. He knows my every flaw and He loves me anyway! He has taught me that it is ok to cry because even Jesus cried. I am no longer tied down by my issues – I am free. “Before coming to Mercy Ministries, I struggled with physical, emotional, and verbal abuse, depression, and self-harm. I couldn’t live life the way I was any longer. A family friend told me about Mercy Ministries. I had also heard Nancy speak at my church, and I knew it was exactly what I needed, so I applied to the program. While I have been at Mercy, God has healed me completely! He has shown me his everlasting love and forgiveness. I have learned that He never will leave me or forsake me. Mercy will truly change your life. Freedom is the best feeling I have ever felt in my life. I have joy and peace and so much more! God wants to heal you completely and set you free!! Congratulations girls! We are so proud of each and every one of you!